Baby love | write meg! Hi! I miss you guys. I miss this space. I miss shaping my disjointed thoughts into some sort of order, but . . . well. With a 6-week-old, I am more exhausted than I ever thought possible. My mom once told me that, reflecting back on my own newborn days, she couldn’t believe she could be so tired and still physically standing. But Mr. Ollie is napping after his 6 a.m. feeding. I had the option of returning to the couch to try and catch a little more shut-eye, too, or popping on here to check in . . . and I chose you, friends. Anyone who has spent time caring for a newborn understands my grand gesture, right? Oliver has been home for three weeks today. By the weekend, he will have been with us longer than he was in the hospital, which feels like a major milestone. Little by little, the chaos and pain of those early days has begun to dull. Slowly but surely, I find myself dwelling less on the minutiae of the NICU and our complicated early experiences as parents and focusing more on who this fella is already becoming: our sweet, lovable, sleepy baby man. There are moments I feel very zen — calm, peaceful, in love with this child. And there are times I feel frazzled, worried, anxious. The two often coexist, rearing up within the same day, the same hour. I am in the waning days of my maternity leave, meaning work lurks just around the corner . . . and at one of our many 3 a.m. feedings, I started to panic thinking about how life will look in just a few weeks. But who or what can possibly prepare you for parenthood? For those 2 a.m. screams and endless dirty diapers and the responsibility, my God — the responsibility. The all-consuming need of this brand-new human: the one you love with your entire heart, though really? You’re still just getting to know each other. Sometimes I think about how Ollie was with me for eight-ish months but how he was a concept, really — a beautiful concept that was kicking, yes, but not one I’d processed was actually coming into the world. In the very beginning, especially, I would stare at him in his little bassinet and think, That is a person. We made a person. A pretty cute one, I think. Though I’m certainly biased. Our days right now are . . . well, they’re pretty relaxed. Quiet. Oliver is a very easy, happy little baby. He eats every three hours and generally naps in between, so I try to get little projects done while he’s out. Perhaps thanks to his time in the NICU, Ollie is rarely affected by noise. Sudden sounds startle him, of course, but vacuuming? Hair dryers? Televisions? Loud conversations? Nothing. For all my work around the house, though, I am also trying to relax. I haven’t had this much time off work since getting my first job at 18. Though it hasn’t been a vacation, I have enjoyed a break from the norm — a departure from all my regular duties. I’m catching up on things I normally don’t make time for, like all the movies and TV shows I’ve DVR’ed over the months. Ollie and I watched “The Fault In Our Stars” yesterday — I cried, unsurprisingly — and read together frequently, both his books and mine. I would have been 39 weeks pregnant tomorrow, so we’re still in the very early days — and his patterns could all change. Preemies sometimes “wake up” close to their due dates, suddenly undergoing a personality shift — or an energy surge. Heck, according to his adjusted age, Ollie is currently -1 weeks old! I suspect things will change. I’m learning to be okay . . . with lots of things. Our sudden entrance into parenthood has taught me to adapt, after all — and be loose. Not to plan too much or too far, and trust that the pieces will fall into place with patience. That’s never been my strong suit — patience — but I’m trying there, too. He “smiles” all the time — an adorable, gummy look that usually follows a healthy dose of milk. Sometimes he “chuckles,” too: a long smile that looks like a noiseless laugh. When he’s awake, Ollie is always taking in the world around him — and is already fascinated by ceiling fans. He occasionally makes eye contact, but still seems to be figuring out who the heck we are. And that’s fine. We know exactly who he is. And man, we love him so. Congratulations on your new little miracle. He is adorable, many congratulations to you and hats off for still having the energy to engage with us. I don’t think I would have been able to! Parenthood is exhausting but wonderful too, it’s strange how those two differing feelings can be combined in such a way but they certainly can and do when you become a parent. I remember reading that boys are drawn to mechanical motion such as fans and objects that are moving, while girls are drawn to faces and people 🙂 something to keep in mind when he does become hard to entertain! He’s adorable and growing so fast!! It all goes by so fast, but remember there are new fun things with each change as well. Your little guy is so precious. This is such a beautiful time in your life, you are going to be so glad that you cherished every second of it (even the anxiety-riddled seconds). 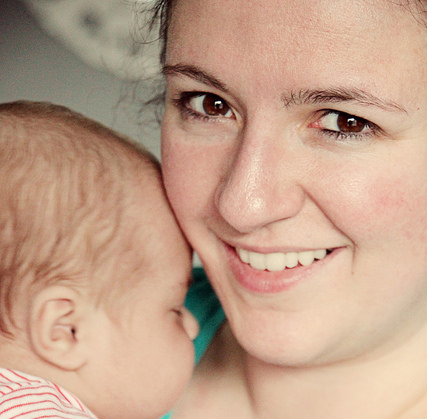 You’ve beautifully described the joy and pain of motherhood. It is exhausting, nerve-wracking, painful, and the best experience of life. You will never sleep well again (although every bit of sleep you do get is better than those first six weeks), but the joy of watching your child grow up and become his own person is indescribable. My oldest turns 15 today, so I know I am waxing poetic here in the throes of nostalgia. As I look on my own boy, who now towers over me, I wouldn’t trade the tears, the anger, the frustration, and the mind-numbing exhaustion for anything. Enjoy every minute of your time with him, Meg. Motherhood is life’s most precious gift. Oh, Meg he is so precious, how sweet! Don’t worry everything will be normal again. It just takes a little time. What a sweet and precious post, Meg. He is a little doll. Congratulations! I’ve been wondering how you guys were doing! Oliver is a very handsome little guy. You are truly blessed. Love this post! He is a cutie! He is so adorable, Meg. Congratulations!! Congratulations – adorable – May God Brings you happiness, joy and pleasure! He’s adorable! Congratulations. I adore those newborn days. Awww! Thanks for sharing these pictures with us. He is soon cute! 🙂 I could completely relate to your post. The first few months are tough, but once he drops that middle of the night feeding, you’ll be set. Enjoy this special time and thanks for checking in with us! Congrats on your baby. It gets better and they’re so worth it, of course it doesn’t feel that way when you’re a walking zombie. 🙂 Enjoy it all because they grow so fast. Oliver looks just amazing – healthy, big, and strong! You guys are doing a great job. I totally hear you… parenthood is so much harder than I ever could have expected and I flip back and forth with my feelings too. It’s worth it though! There is truly nothing in the world like motherhood!